ingredients which Brewers of Romania provide consumers the tastiest of the drinks: ”. The hop is the main natural ingredient of beer. It has to be found not only in beer but in the consumer’s mind also. a favourable climate for the development of this market segment. Part of Molson Coors, one of the world’s leading brewers, Bergenbier S.A. company was founded in 1994, and its most prominent brand, Bergenbier, was launched one year later. 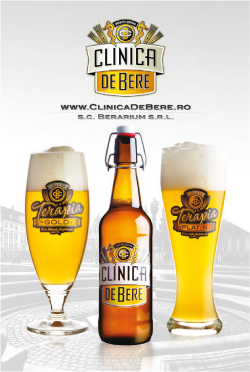 Today, Bergenbier S.A. is among the top 3 beer producers in Romania, has approximately 700 employees, a modern production plant in Ploiesti and a national distribution network. The company’s portfolio includes brands that cover all market segments. Besides its own brands, produced at the Bergenbier factory, the company imports and distributes exclusively the Prague specialty beers Staropramen Dark, Granat and Unfiltered, the belgian abbey beers Leffe and Hoegaarden as well as the world’s most loved mexican beer: Corona. Bergenbier was the first mainstream beer to be distributed nationwide and the first in its segment that launched a non-alcoholic version. Close to its consumers that are treated as friends, Bergenbier offered them along the years, extraordinary events and experiences and always knew how to talk about the true values of friendship. 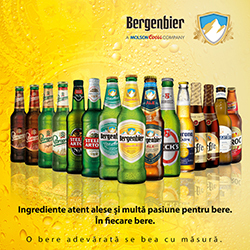 Cold filtered, cold matured and and with natural CO2, Bergenbier has a strong mission to Refresh Romania. In 2018, Bergenbier will refresh by planting 50 000 fir-trees, which is the biggest planting action ever supported by a beer brand. Among the brands produced by the Bergenbier factory there are 3 international strong brands. Stella Artois is a super-premium beer produced in Romania since 1997, following an ancient Belgian recipe. In 2003, Romania was the first country in Europe, after the origin country, that was allowed to produce locally the world’s bestselling German beer – Beck’s. The license obtained by the Bergenbier brewers demonstrates their fine brewing skills. 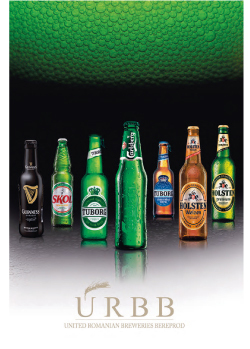 Staropramen, Prague’s number 1 beer, was launched in Romania in 2011, positioned in the core-premium segment. Noroc is a popular beer with rich, full taste, that goes great with any dinner with friends or family. We have started with a business family in the Netherlands and, in over 150 years, have written our story as a global, independent beer producer. 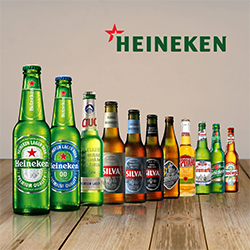 We have turned HEINEKEN into the world brewer with the most extensive geographical presence, balanced between developed and emerging countries. We are proud to have more than 80.000 employees all over the world, run operations in over 70 countries and particularly because the Heineken® brand is present in more than 190 countries across the globe. It’s been 20 years since HEINEKEN started its activity in Romania and we have got to the point where we generate over € 250 Million budget revenues from the production and selling of beer. With four production units in Romania – in Constanța, Craiova, Târgu Mureș and Miercurea Ciuc – HEINEKEN produces beer using more than 70% of the feed material from local suppliers. We employ 1.100 people across the country who help us brew or commercialize over 20 beer brands, offering a variety of beer types and tastes for Romanian consumers. Inspired by Romanians, we will continue developing beer industry on the local market, including innovation in everything we do. We have taken local commitments to reduce our global footprint on environment, promote responsible consumption and mitigate alcohol abuse and we will also continue, in 2018, to encourage sustainable development. Furthermore, this year we will again contribute, through our products, to building the most enjoyable experiences people can share. exactly what to offer him. Ursus Breweries is the largest brewers in Romania and operates 3 breweries in Brasov, Buzau and Timisoara and a mini-brewery in Cluj-Napoca. Ursus Breweries has a balanced beer brands portfolio, consisting of authentic Romanian beers, with a long and rich Romanian heritage: URSUS – born in 1878; Timisoreana – brewed in the first historically documented brewery in Romania back in 1718; Ciucas – whose story started in 1892; Azuga – which dates back to 1870 and Stejar. The portfolio includes also prestigious international brands like: Peroni Nastro Azzurro, Grolsch, Redd’s, Efes, Pilsner Urquell and St. Stefanus and also a premium cider brand – Kingswood. The fact that 1 in 3 beers consumed in Romania belongs to the Ursus Breweries portfolio says a lot about the quality and the appreciation enjoyed by our beers. 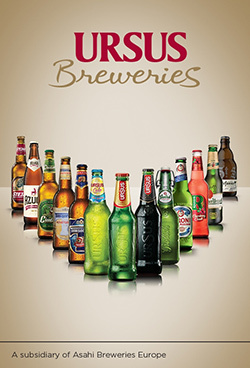 Innovation is a permanent ally, and through the value chain, which starts from the farmers, and goes on to the retailers, Ursus Breweries seeks to generate a favorable development of inclusion, a sustainable use of resources and a responsible approach to beer consumption. We are honored to be one of the founding members of the Brewers Association and we will continue to be partners on the pathway of a sustainable development of the brewing industry, which brings an essential contribution to Romanian economy.